Our bones travel many miles with us throughout our lives, so it’s important to give them some TLC so that they can keep moving with us. Bone density deteriorates with age, often causing discomfort and sometimes even injuries or breaks. Medical conditions caused by bone loss such as osteoporosis affect millions of people worldwide and can lead to very serious injuries. The good news is that there are preventative measures that you can take to avoid bone injuries and to promote healthier bones. Below are some tips for keeping your bones strong. We’ve all heard great things about vitamin D, such as its help in boosting immune function. It turns out that getting plenty of vitamin D is also important in boosting bone strength. Vitamin D aids in the absorption of phosphorus and calcium in the bloodstream and coupled with calcium can help build stronger bones. Vitamin D also helps with painful conditions like rickets which cause bone loss. Reduced access to adequate sunlight and poor dietary choices can lead to vitamin D deficiencies. Fortunately, increasing consumption of certain types of food such as eggs and soy or simply adding a vitamin D (with added calcium) supplement to your daily routine can improve vitamin D levels. Calcium is a nutrient that helps develop bone tissue, and vitamin D helps your body absorb and process calcium. Together, these two powerful nutrients are the building blocks of healthy bones. The Institute of Medicine recommends 1,000 mg of calcium a day for most adults and 1,200 mg/day for women after menopause and men after age 70. It’s important to aim for a minimum of 3 servings per day of a calcium-rich food such as dairy products like yogurt or milk, or dark leafy green veggies like spinach, or opt for a calcium supplement. From stress reduction to heart health, the benefits of exercise cannot be understated. Weight-bearing exercise can also be a major factor that contributes to bone health. Strength training is a good option for older adults if it’s monitored closely, but other forms of exercise can be just as effective at promoting strong bones. 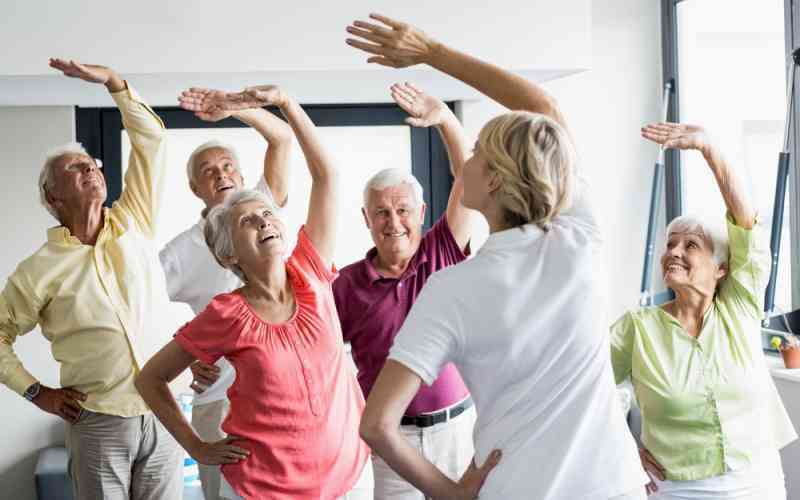 Exercise programs such as yoga, Tai Chi, dancing and walking are all fun ways to keep muscles and bones supple and strong. Beyond calcium and vitamin D, there are other nutrients that contribute to the overall health of bones and muscles. Magnesium and vitamins B and C not only play a large role in bone health, they also contribute to a healthy immune system. Eating a well-balanced and wholesome diet can help protect against many potential health issues. Choose plenty of vegetables, fruits, nuts, whole grains and beans, and avoid processed foods. Review your list of medications with your doctor. Some medications, such as corticosteroids, can contribute to bone loss. Avoid or reduce your intake of alcohol and caffeine. If you’re experiencing bone loss, work closely with your doctor to create a treatment plan. At Kyffin Grove, we believe that healthy bones contribute to a longer, more active life. We offer delicious meals made from a wide variety of wholesome ingredients, and we offer our residents a broad selection of exercise programs. Contact us to schedule a tour and to learn how you can live your healthiest life.